The sweet spicy dressing sets off the succulent shrimp. This dish pulls together fast if you use pre-cooked shrimp. Try those plastic boxes of organic baby greens rather than bagged salad. It's more expensive than a head of lettuce but cheaper than bagged. And for some reason the boxed salad greens stay fresher longer than the bagged lettuce, even after you open the box. Okay so here we go on our Asian journey. Combine 1 part rice vinegar with 1 part oil and 1 part freshly squeezed orange juice and the grated rind of that orange. Add no more than 1/2 teaspoon of toasted sesame oil to a half cup of the dressing or the flavor will overpower the dish. Throw in some grated ginger and garlic. Add a chopped jalapeno pepper and sweeten to taste. You could use brown sugar or honey. If you don't have jalapenos, use cayenne pepper, red pepper flakes, hot sauce or chili oil. Go easy on the spicy seasonings. You could always add more if you want to bump up the heat but it's difficult to remove the little pieces of jalapeno if the dressing is too hot. Mix well. A few dashes of soy sauce finishes off the dressing. Toss together one cup of the lettuce with another cup of your choice of chopped vegetables for each serving. Scallions, shredded carrots, water chestnuts, frozen peas and cucumbers are all good choices. Don't worry about cooking the peas. They'll defrost by the time you're ready to serve the salad. Add about 1/4 cup of the dressing for each serving of salad and toss well. Plate up the salad. Top with the cooked shrimp. 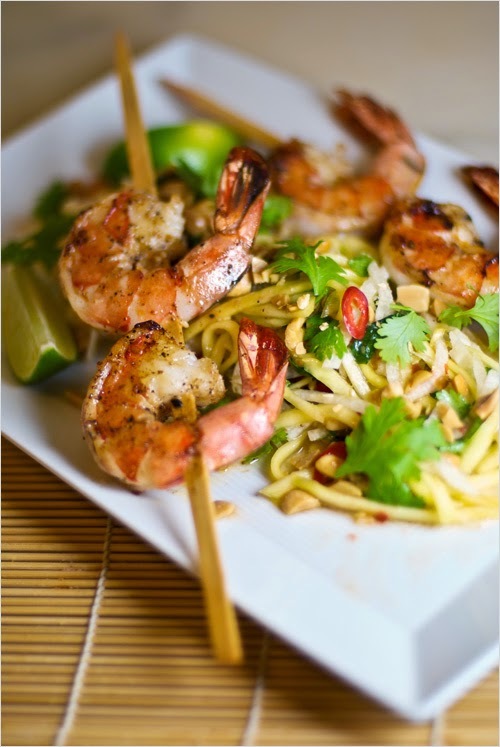 Garnish with slivered almonds, crunchy rice noodles and a few slices of fresh oranges. Drizzle a few more tablespoons of dressing over the shrimp. 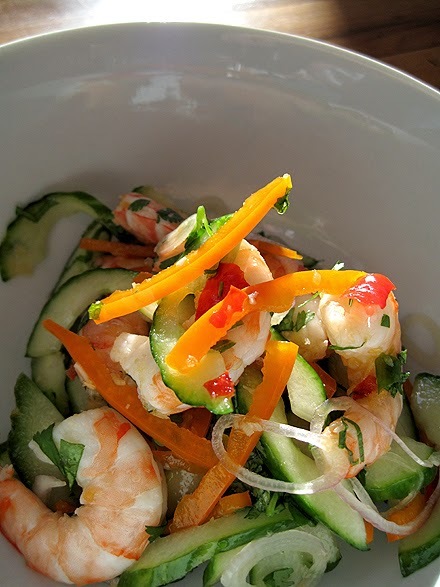 The next time you're grilling, grill some extra shrimp basted with the salad dressing, put in the freezer and you're good to go with this salad at the last minute. That's it. If you want to make the salad more substantial. Boil some angel hair pasta. Immerse in ice water and drain. Toss the pasta with some of the dressing. Put the pasta on top of the salad and top with shrimp and garnishes. Continue the Asian theme with dessert. Almond cookies and lime sherbert works well or sprinkle a scoop of vanilla ice cream with shredded coconut. An array of activities, besides riding, exist for you and your horse. Most horses enjoy human companionship and attention. If you do not have a whole lot of time before and after your riding, but you would like more bonding time with your horse, try to come to the stable a little early, even a few minutes can help. Spend those few minutes with your horse, taking your time brushing him, talking to him, and rubbing some of his favorite "sweet spots"; he will thank you for it with a good ride because he is relaxed and happy. 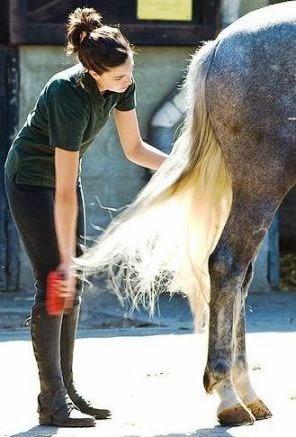 If you live with your horse and just enjoy spending time with him and want to bond to him, you can groom him; horses love to be groomed, it is like an all over body massage, and, it tones his muscles. You can also give him a massage, you do not have to be an expert by any means to do this, just find an area that he loves to have rubbed and scratched and rub and scratch it; you will find yourself with a very relaxed, happy, horse that really enjoys having you come to the stable because he knows it means positive things. Aside from grooming and massages, braiding your horse's mane and tail can be very relaxing, but do not just jump right to it, some horses do not appreciate having their manes and tails pulled at even for braiding; others find it relaxing, like a scalp massage. Another way to spend time with your horse is to play games with him. Take a couple treats out to the pasture with you and make him chase you for them, or make him jump over a small jump to get a reward. 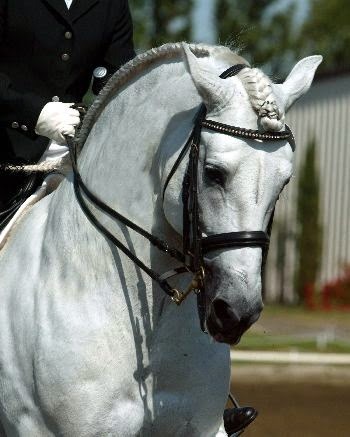 You can even turn it into a training session, if you have a horse that dislikes water, put on a pair of waterproof boots and stand in the water of a stream or creek and offer a treat for each step the horse takes into the water; or if he hates being tied, work with him on standing quietly tied to a post or in cross ties, giving him a treat each time he stands still. Working with your horse can be a lot of fun, but do not let him pick up bad habits such as nipping, biting, or pushing to get treats. A pushy horse is a dangerous horse because he thinks that he is the boss. Horses are large animals and can do a lot of damage. Make him be respectful of your personal space, and you will be happy and so will your horse. Pregnancy pilates can help maintain your as well as your baby's health. Many doctors advocate routine exercise for pregnant women to aid normal delivery. Pregnant workouts such as pilates are easy to do and can be continued up until the last stage of pregnancy; however, you should slightly alter the movements at every stage of pregnancy so that it will not affect your baby. The following post on pregnancy pilates can be of great use for pregnant women. You should consult your doctor before starting any type of exercises during pregnancy. 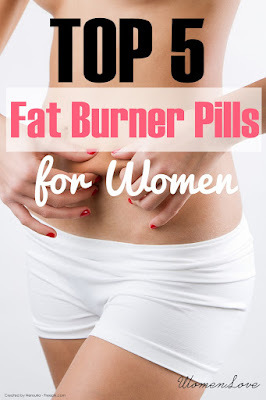 If you enjoy sound health, then you can choose from diverse pregnant workouts. Pilates and pregnancy make a great combination since pilates are aimed at making your pelvic floor, abdominal and back muscles stronger; all of which can go a long way in ensuring easy labor and delivery. Exercise for pregnant women can prepare the body for labor and delivery by strengthening it. You can search for pregnancy exercise classes after getting your doctor's approval for pregnancy pilates. You should preferably choose classes that can guarantee to give you personal attention. Pre-natal classes or pregnancy exercise classes are conducted everywhere and you can easily find one in your area. You can benefit a lot by choosing an experienced teacher who has several years of experience in assisting pregnant women with the best exercises during pregnancy. Once you have completed your training, you can buy pregnancy pilates DVDs that you can use right from the comfort of your own home. Pregnant workouts and pilates exercises can be easily modified as you advance in your pregnancy. Your instructor can guide you regarding the best pilates exercises to follow for every stage. You should avoid back bending or floor exercises, especially during your first trimester. The best thing about pregnancy pilates is that there is a lot of movement involved that can help keep you flexible and healthy until your delivery. Speaking of some important pilates performing tips, you should not over stretch or over extend your muscles while performing pregnancy pilates. In the first semester, you should lie more on your side and not on your back while performing pregnant workouts. You should also avoid placing your feet over your head, as this can arrest blood flow to your baby. This movement can be modified by lifting your leg half way. The use of balance enhancing equipment by pregnant women should also be kept to a minimum. By following these simple steps, you can ensure the well-being of you and your unborn baby. Doing exercises during pregnancy is very beneficial to your baby. Apart from feeling all the sounds and moves, the baby can benefit from the improved blood flow due to your exercising. Good blood flow in your body helps the baby's development. Pregnancy exercise classes or pregnancy pilates can be of extreme help even after the baby's delivery. New mothers can regain their slim figures easily and quickly through pregnancy pilates post delivery. Pregnant workouts can help tighten the bodies of young mothers gradually. By being consistent with your pilates routine, you can get your legs, back and abs in great shape maybe even in better shape than before. Before choosing a pilates class, you may want to visit some pilates studios to learn more about the way they conduct pregnant workouts. Based on research you can easily find a class that meets your needs or specifications. Also, by investing in a few prenatal pilates DVDs, you can easily perform all the movements in your home. I was at home making up a batch of cookies. Some how I accidentally added melted butter to the cookie batter and the cookies came out greasy. I didn't want to waste the batter since I don't like wasting food and decided I would recycle the batter. I didn't know what I was going to do with it until I ran across a bread pudding recipe on the internet. I decided I would try to make a bread pudding using the ingredients I had. 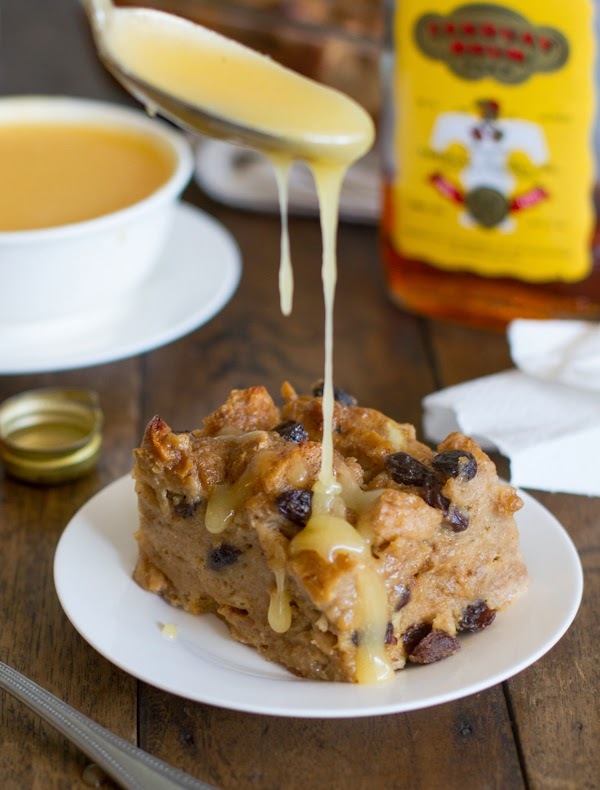 I had never made a bread pudding before but I had made a corn pudding. I was using peanut butter for the cookie dough and turned it into a totally different recipe. 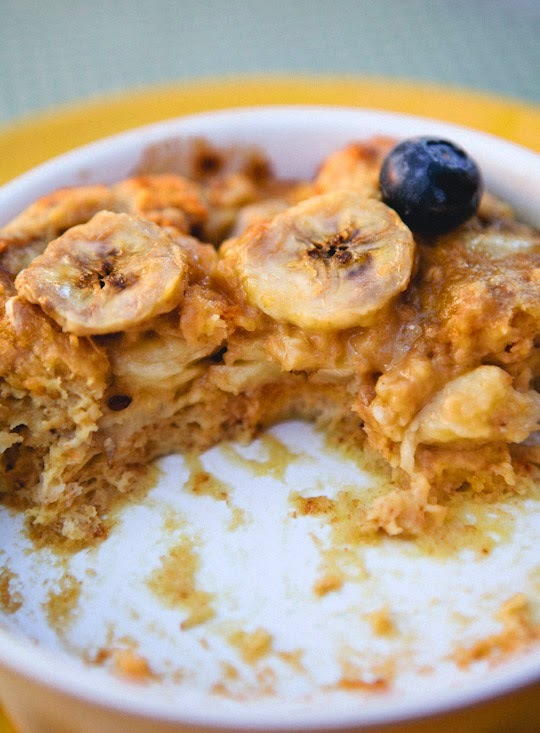 Here I will take you through the steps of baking peanut butter banana bread pudding. This recipe is simple and doesn't require making dough. Pre-heat the oven. Grab a mixing bowl for your ingredients. Measure out ½ cup peanuts and put them in a food processor to chop. In the bowl combine the peanut butter and chopped peanuts. Melt the half stick of butter in the microwave and add to the bowl. Then add in the milk and 2 eggs. Cream together the brown sugar and granulated sugar with the mixture. Now that you have a chunky creamy mixture, add in the vanilla extract and 1 tbsp cinnamon. Mix in ¼ cup bread flour. Peel and slice the bananas into ½ inch slices and fold into the peanut butter mixture. Grab some bread; I used 6 slices for this recipe. Remove the crust from all sides of the bread. Cut the bread into little 1 inch squares and mix into the ingredients in the bowl. Butter the sides and bottom of a loaf pan. Sprinkle about a tbsp of flour in the loaf pan. Shake the flour around until it coats all the butter inside the pan. Pour the peanut banana butter into the loaf pan. Sprinkle the loaf with 2 tbsp sugar and 1 tbsp cinnamon. Bake in the oven on 350 degrees for 50 minutes. Take the loaf pan out of oven and check with a toothpick. If it comes out clean then the loaf is ready. Let cool and top with whip cream. 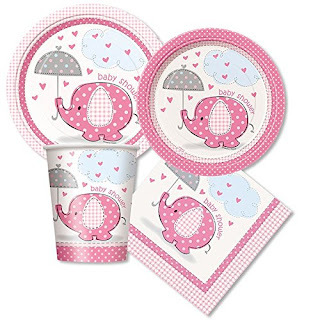 Choosing your baby shower theme makes the party more fun for your guest to attend and more exicting to plan. 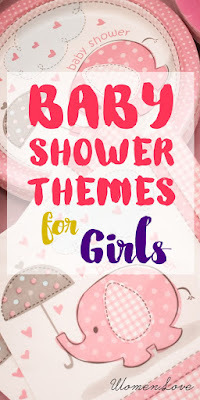 There are so many themes for baby shower for girls that fit for the needs and personality of new mom. Pretty in pink. Yes baby shower theme can be simple as a color. One of the best choice for girls is pink, but necessarily the only choice. For a simple pink invitation, send your guest It's a Girl themed pink and brown invitations. Search thank you cards and matching banners and buy everything for coordinating decoration you need in one place like Amazon instead of searching all over town (or the Internet). Baby items theme. Pink baby invitation or booties might be good for a baby sprinkle theme. You can ask the guest to bring some basic needs for the new parents who are expecting their first baby girl. 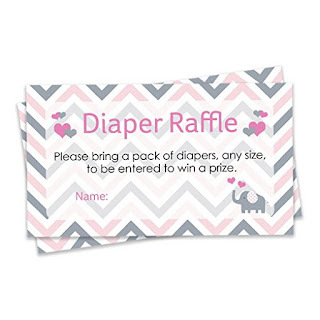 Or you can choose a diaper themed invitation and ask your guests to bring a package of diapers for a raffle. Baby animals themes. 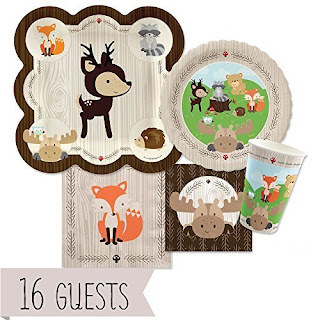 Animals theme can be cute theme for girls. 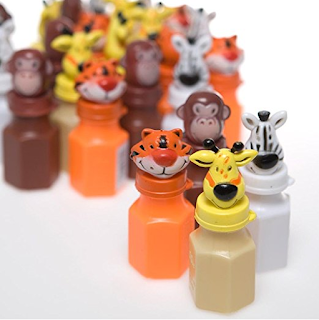 To incorporate your animal theme into the entire baby shower, choose a theme with multiple animals represented such as a jungle animal theme or a farm animal. 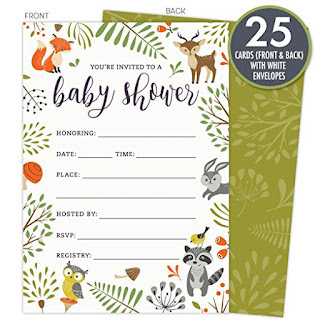 There are countless decoration, invitations, and favors available so you can host a baby shower to prepare for a baby girl. Remember to keep it fun and cute to create a memorable experience for the mom-to-be and your guests. 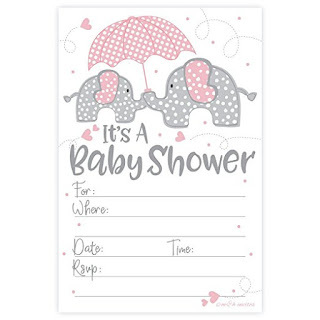 You can buy the baby shower stuff here.